This entry was posted in knit, knitting, shawl, travel and tagged knit, knitting, travel, vacation by Patti_is_knittinginflashes. Bookmark the permalink. Oh no! Hope u get moving soon! A total of three hours was way too long. We wanted to turn the car off but it was so hot, we knew we wouldn’t be able to deal with the heat inside the car. Come on back! We’ll take you! Between the fiasco with the closed restaurant and this accident, we were four hours behind in our schedule. We made it though and had a nice dinner and visit with Mr. Aitch’s niece. I felt your presence when you were in Ohio!! 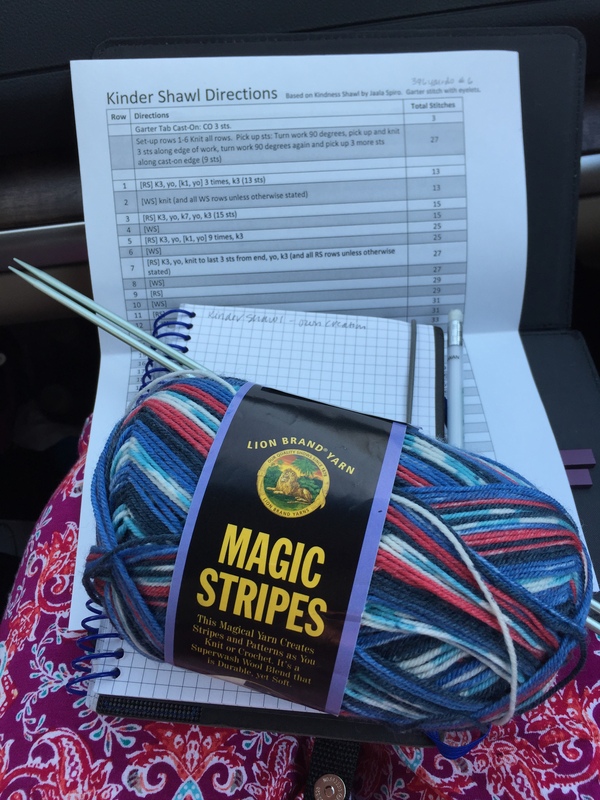 Nothing like an interstate to get a lot of knitting done, as long as you are the passenger, that is! I told Mr. Aitch that I could operate the GPS and my phone or drive. I’m not that good to do both…despite the fact that that would be illegal and dangerous. He had the option so he chose to drive. An accident 7 miles ahead caused the delay and then another accident on the detour just added to the wait. I pray that no one was seriously injured or worse. I too hope no one got hurt. And that you eventually got to where you were going!